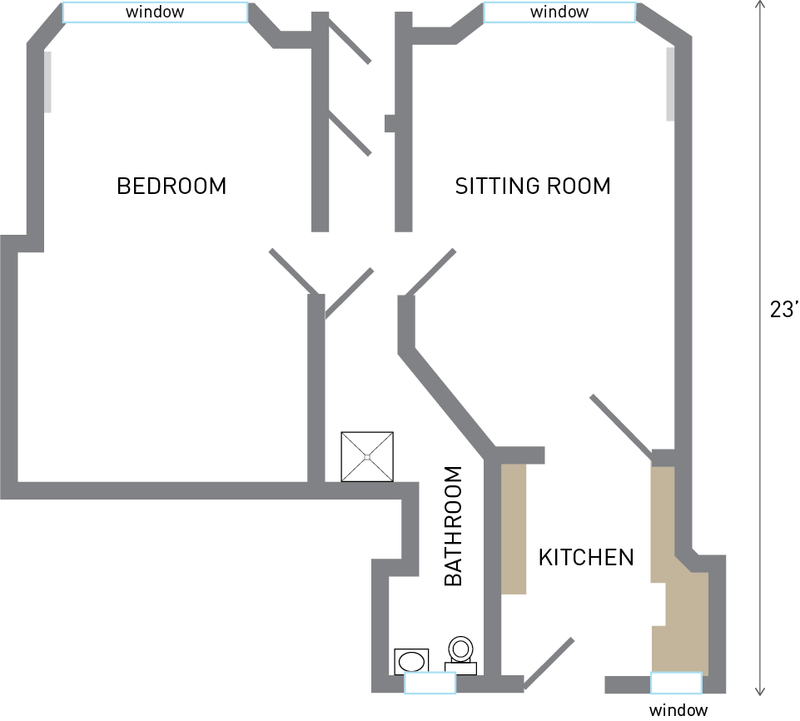 The Flat has an interesting but very workable layout (see floor plan below). Many years ago the building was converted into two flats and an extension built – which gives it a slightly quirky feel. Comfortable sofa, easy chair, gate-legged dining table and chairs. TV, DVD Player and Bose CD/Radio. Morso multi-fuel stove and Rointe electric Heating. Fully-equipped with electric hob and stove, microwave, washing machine, fridge, toaster and kettle. Small freezer in garden shed. Large bedroom with views over river, contains double bed, wardrobe, big Victorian chest of drawers, easy chair. Rointe heating. Bedside lamps, radio and clock. Luxurious walk-in shower, wash-hand basin, toilet, electric shaver points, heated towel rail. Plenty of space to hang coats and to leave muddy boots. Telephone and free wi-fi. Small south-facing back garden with garden furniture. Drying line. Shed containing small freezer. Electricity and one basket of logs are included in the rental. Strictly no smoking or pets allowed. Extra logs and coal are available locally. 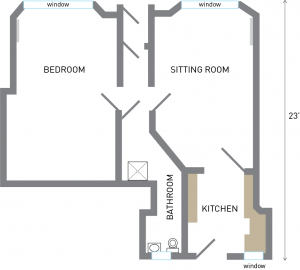 Sadly not wheelchair or wide walker accessible due to door width and layout of bathroom (see floor plan). The Flat is on one level so accessible to those with limited mobility, but there are steps to the garden. Also 5"/13cm lip around the shower. 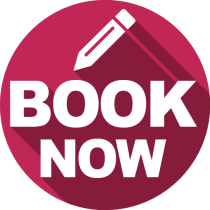 Iron, ironing board, hairdryer, clothes dryer, bed-linen and towels are provided.